For this week’s Monochrome Madness, the theme is wild. I have been to several places so remote, not even the governing agencies could answer my inquiries as to trail conditions or water reliability. And although these remote places are seldom seen by people, images captured there may not necessarily reflect the feelings of isolation. Bryce Canyon, the location of my photo, has spots that you can hike to that will give you a feeling of being in a wilderness, but most of the trails will have you hiking side-by-side with a bunch of strangers. Despite that, it is still the wildest looking place I have ever been to. This is my contribution to Leanne Cole’s Monochrome Madness this week. To see what other photographers have contributed, or instructions to join in, visit her website. One of the great places to hike and take photographs in the southwestern US is Arizona’s West Clear Creek Wilderness. Hiking becomes wading in many places, and swimming in a few. Despite being in the middle of Arizona, there is a short season. From July through August, there are many days when the thunderstorm threat makes this canyon a bad choice. Mostly the short season is due to the cold, not the heat, and the fact that you will get wet at some point. The longest of the pools is unswimmable, even at the end of summer, due to hypothermia risk. For photography, the creek is more about pools than flowing water. Mornings usually have the stillest air, and glass-like reflections can occur. As the name implies, the water has a beautiful clarity to it, and the rocks in the creek bottom add to the subject matter. The shot above is a mixture of the reflection from the cliffs above, and seeing to the rocks below. I took this in early afternoon, and my timing was based on waiting for the passing clouds to produce shadow in the foreground while the cliffs remained lit. This is my contribution to Leanne Cole’s Monochrome Madness this week, and the theme of reflection. You can see what others have come up with this week on her website, or join the madness yourself next time. Instructions for participating are on her site as well. 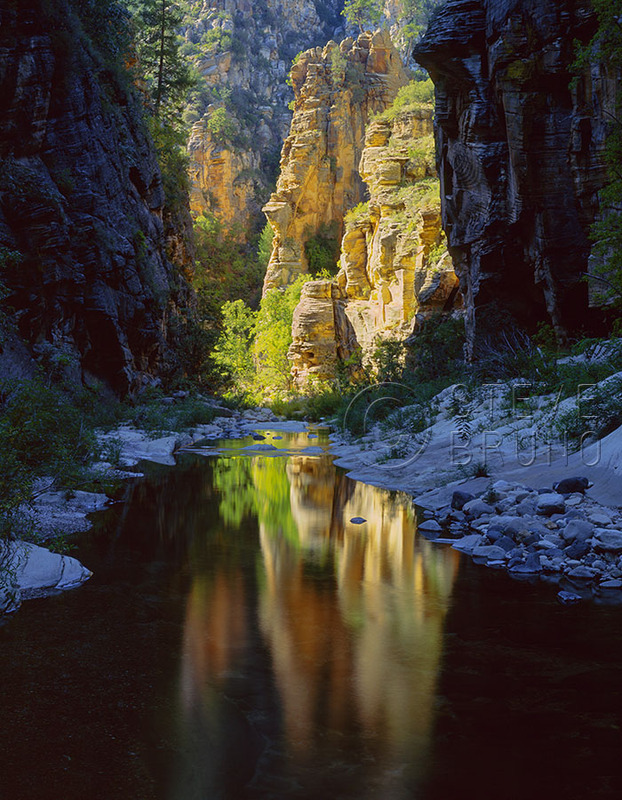 Sunlit cliffs reflect in a dark corridor of West Clear Creek Canyon, Arizona. Photo by Steve Bruno.